This example shows how to use radiobuttons for control Filtering and Sorting of your Dynamic collection. Required structure of the Dynamic Item and process of applying classes were described in the Filtering CMS Content tutorial. After container with Dynamic Items was created and all necessary classes (for filtering and sorting) were applied we can start building our Controls. For being able to use radiobutton elements we have to put them inside the Form. Add a Form to the page (has classname .controls-form in this example). 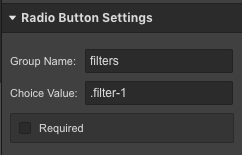 Add radio-buttons with .filter_radio class. 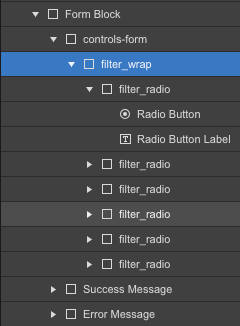 Number of radiobuttons should be equal numbers of filtering categories we have, plus one more for "All" option. 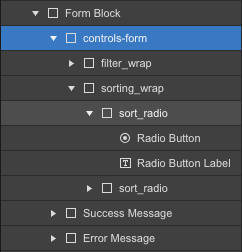 Add values to each radiobutton accordingly to classes that has been created from filtering categories, applied to mix-items. Value should contain a classname in CSS format. For example, if you have a category "Best products", code snippet that we used in the Filtering CMS Content tutorial would convert it into a best-products string. ‍Important! : Make sure to keep Group Name same for each radiobutton. It will show option "All" as an active when page with the filtering content will be loaded. 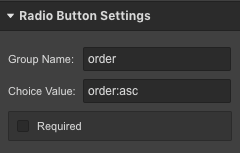 Add two radiobuttons with classname .sort_radio, for Ascending and Descending orders. Currently, Webflow is automatically applying id for each input element and attribute for to its label, generated from the value. This setup is required for making label "clickable" along with the input field. The fact that our values were set as CSS classes might interrupt the HTML structure of our page during the filter request. In first part, similar to the previous Tutorial, we have to declare the reference to the mix container (class .container) , div with filtering radiobuttons (class .filter_wrap) and div with sorting radiobuttons (class .sorting_wrap). This example above is fully functional, feel free to try Filtering or Sorting. Similar to the example with Basic filtering, we have to include the link to the MixitUp library and all required code snippets via <script> tags before the closing </body> tag into the page custom code area. Feel free to open this tutorial's project page and look closer.